The year was 2001. After appearances on Guru's Jazzmatazz and Common's classic Like Water For Chocolate, the Philly born singer released his debut album with Interscope Records on July 17th. The album initially hit with the first singles "Love It", "Soul Sista", and the Jadakiss and Dr. Dre featured "Fast Lane", which was heavily played over the radio at the time. While the singles made a bit of a wave for Bilal, it is the album that is truly flawless in essence, with production from Megahertz, Dre and Vidal, Aaron Comess, the Soulquarians(J Dilla, Questlove and James Poyser), the extremely talented Raphael Saadiq and the legendary and previously mentioned Dr. Dre (who did two tracks here). With a solid production line up, as well as the ability to produce music himself, Bilal presented us with a look into his world and his mind with his first album. cause the mind to trick the eye/ I wonder how you're getting by/"
While Mos steals the show, Bilal comes strong and carries the song essentially with an infectious hook and cadence. Following this, the anthem "All That I Am" hits next, and Bilal weaves through abstract lyrics in his verses combined with a smooth hook to create yet another gem. The only song on the entire album that I'm not a huge fan is "Sally", as the Dr. Dre production is a bit off, but regardless the lyrics are interesting to say the least. 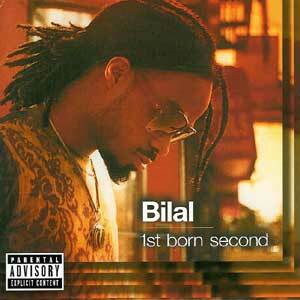 Where "Sally" may have disappointed me however, the following track is my all time favorite Bilal song. Wish I knew the truth without searching... sometimes/"
as I am good to you... and you don't see my intentions, the way I do... sometimes/"
You only do it, cause you know I hate it.... sometimes.../"
I hope I live to see 25... sometimes.../"
After all these lyrics, Bilal goes off near the end repeating "I want to win!, I want to win", and smoothing it out to close out what is an amazing listen and one of the best songs I've heard honestly from any artist over the last 10-15 years. It's soul stirring, motivating and reflective all in one. The soulful "Love It" continues the listening experience and Bilal ends up serenading the lady of his affection and telling her that regardless of whatever, he loves her and she's the peace of mind he requires to keep going. The hook is truly infectious and so is the bridge on this track as well. So only it knows, this kind of vibe gets stronger in time"
And if the rain won't fade away, my love would still soar/"
After this amazing track, we arrive at the solid "Love Poems", another track where Bilal manages to yet again coast and create something special. However, it is the Marsha Ambrosius featured "You Are" that truly elevates the 2nd half of this album. A smooth soulful track, this features both Marsha and Bilal at their best, and while Marsha is more so in the background for the hook and not a part of the verses, her presence is certainly felt on this track. This is another one of my personal favorites and the production here is excellent and well put together. The melodies and the harmonies on this track are probably the best on the entire album. The reggae inspired "Home" is a truly feel good song, and Bilal once again gives us a gem to appreciate. The production here is fun, the vocals are superb and the entire vibe of the song is yet again infectious. The background vocals on the bridge are also so dope, and I can't help but sing along with it. As we reach the climax of the album and this listening experience, Bilal hits us with a pretty funky joint in "Slyde", which is very reminiscent of the old George Clinton style along with the present day style of funk. Bilal creates an undeniably fun track here and leads us into the final track of the album, the slow "Second Child", which is as close to a title track as you get on this one. This song is a bit darker than the rest and while a different way to close out this album, it works well enough here. All in all, as I revisit this album to write this, the album is timeless music. Bilal made something that is near perfection and it's very impossible to truly change that. When we look back at the best albums in R&B from the 90s to now, First Born Second will certainly be on my list. It is that good. Have any comments or opinions? Be sure to post them under the comments and share your thoughts.